Our flagship bridal store is located in Arizona. 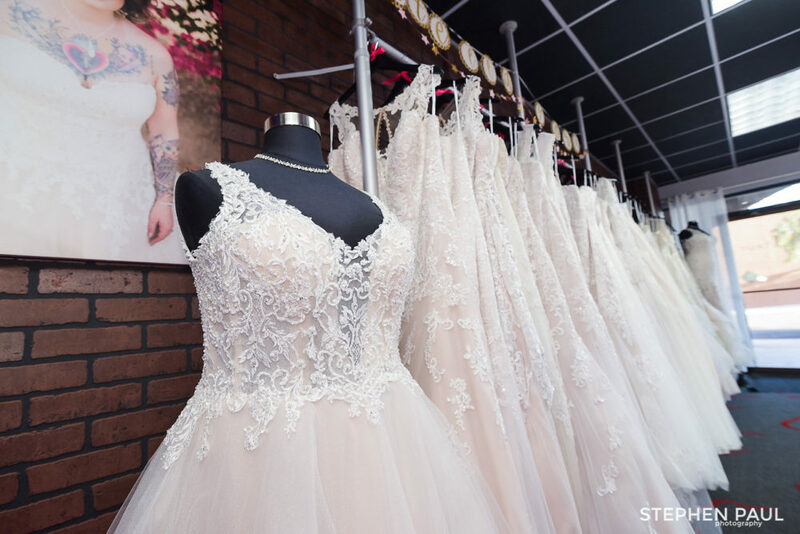 After five years located in central Phoenix, Strut Bridal Salon moved to Tempe, AZ in January 2015 to expand–we needed more rooms!–and to get more parking for our awesome brides. You’ll find our new wedding dress store location on the northwest corner of Southern Avenue and Mill, just around the corner from Fry’s grocery store. We’re tucked behind a Mexican restaurant, so just look for the Red Devil Center sign. We’re located in a small center on the NW corner of Southern and Mill, around the corner from Fry’s, in the Red Devil Center. Look for dresses through the windows! You can reach us via phone at 602.252.4414, or via email at service(at)strutbridalsalon.com. There is free parking in our large lot. While appointments aren’t required, we do recommend them so you can enjoy our award-winning, expert, one on one service. We carry wedding dresses, bridesmaid dresses, and social occasion and prom gowns. We really look forward to helping you look and feel amazing on your wedding day! Book your visit today!